I’ve got my son a bell lyre for a good deal the other day. He needs the bell lyre after he joined the Drum and Lyre Band in school. I got the musical instrument for P1,100.00 ($27) and comes with a free case. It’s original price was P1,500.00 or $37. But a friend said I can get the same quality of lyre at much lower price in Raon (Quiapo, Manila). Unlike other complicated instruments, bell lyre is easy to play according to my son. It’s the first real musical instrument we have at home. Next on our shopping list is a guitar. I saw a really nice guitar (in the same store where I purchased the bell lyre) for only P999.00. 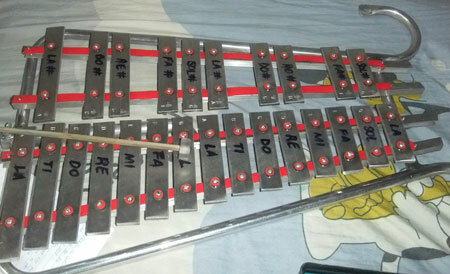 This entry was posted in Musical instrument and tagged bell lyre, musical instrument on December 9, 2012 by Mommy Yam.